In a time when I can expect any news I get to be bad news, the GoFundMe project to save my house has a little bit of the good kind. As I write this, donations stand at just over $2600; in the meantime I’ve finally received a check I was waiting for, and after paying my property taxes I figure I’ll be able to kick in $1000 more. Taken together, that puts me at about 1/3 of the way to replacing the house and porch roofs, which will please my insurer and keep me in my house. Good news! But the clock is ticking. If I’m not able to call the roofers around the first of March then I’ll be right back where I was. I’m glad I asked. This means that there are just a few more weeks left to come up with the other 2/3 of the cost. That’s about $8200. So, yeah. That’s the bad news. Although I hate to stand here on the corner with my cap in my hand, I’m still asking anyone who can to consider dropping something into the project. Lots of little bits can go a long way: though I’ve had three donations of $500, the rest has come in smaller amounts. So anything is welcome. Here we are in February. Have a good one! W. B. Yeats’ poem The Hosting of the Sidhe with my 1982 illustration for it, from Runestaff #5. 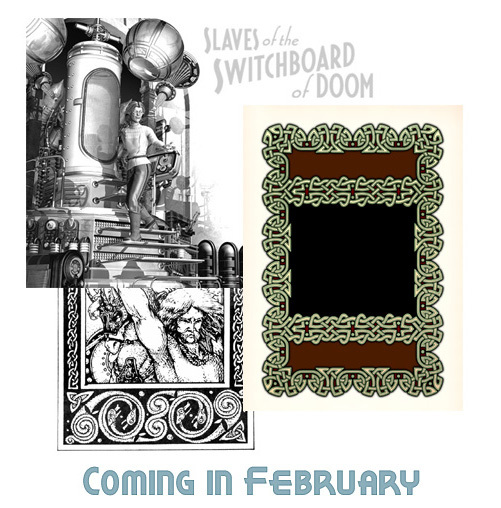 The Chapter 5 first draft from my unfinished sequel to Slaves of the Switchboard of Doom. It’s probably my favorite of the six chapters I wrote. Don’t tell the other chapters I said so. The Big Mad Science in Slaves of the Switchboard of Doom examines the way Retropolis has dealt with its abundance of Mad Science. Is there a method behind the madness? Read and decide.